Questions about the role of narratives, art and work in constructing communities structured my conversation with Isabel Lima at the Tate Exchange’s “Who are we?” project. We sat beside a wooden cart with some wooden plant holders (some with young vegetable plants in). These, it emerged, were some of the remains of a Wooden Horse — like the Trojan one but with a dramatically different purpose. While other blogs in these series replicate the format of conversations with artists, activists and curators, this one is more of a reflection on a conversation that circulated around the theme of the transformative potential of art and performance. We began by talking about the relationship between the Trojan Horse and Isabel’s project Gresham’s Wooden Horse, and encompassed what artists do, how communities can be divided or connected, how those with power can facilitate or frustrate others, how art-works can have afterlives, and much more in a remarkably short time. First of all, the Gresham horse. Well, first, Gresham. Isabel reminded me of the stark moment when the British media disseminated the news that the places where migrants and refugees were being housed in the Middlesbrough’s Gresham neighbourhood all had red doors. They were therefore easily targeted by those hostile to outsiders. In this area of social deprivation, tensions were high. Isabel conceived the notion that a new wooden horse could be a way of taking control of territory. Just as in Troy but with an ambition to connect rather than conquer. There is a trick here: a conceit that public art work (work to produce, display and engage with art) can be for the public good. Rather than the deceit of hiding power and purpose, or the pretense of withdrawal to allow locals to flourish, the Gresham horse was an aspect of an investigation of the responsibilities of artists (perhaps especially those with public funding). In a context of precariousness (a condition of our time), Isabel aimed to facilitate and co-produce means by which the community could increase its self-representation as well as self-understanding. This begs the question, “What community?”. So, the real trick was to get people involved together. The co-construction of a large structure, its movement through the streets to an area damaged by the effects of global processes (financial, military, climactic and other), and the shared celebrations of its success were all stages in making a community for which this could become a community project. 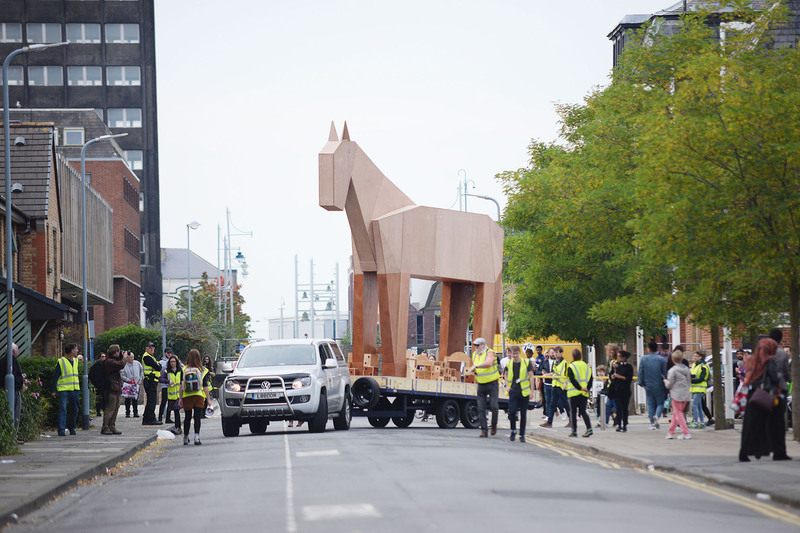 And it did not end with the celebration of the horse’s arrival in a space made in the demolition of homes. The horse became a cart because the council refused to allow it to become a permanent installation. The cart, however, re-assembles the wood, the labour and the community by providing a means of sharing plants, coffee and other things. In short, Isabel and I talked about the political and social roles of art, theatre and performance. Even ancient tales — like that of the Trojan horse — have an archetypal power. They capture imaginations and can, when told or performed in suitable ways, do more than entertain. As Isabel puts it, they can be listening acts not only speech acts. Art works to make us even as we work to make art. And making things together not only brings people together, it re-assembles communities with confidence that more can be done.